Stay at the Fforest Inn on a Freerein horse riding holiday. The Fforest Inn is located in the pretty hamlet of Llanfihangel Nant Melan. 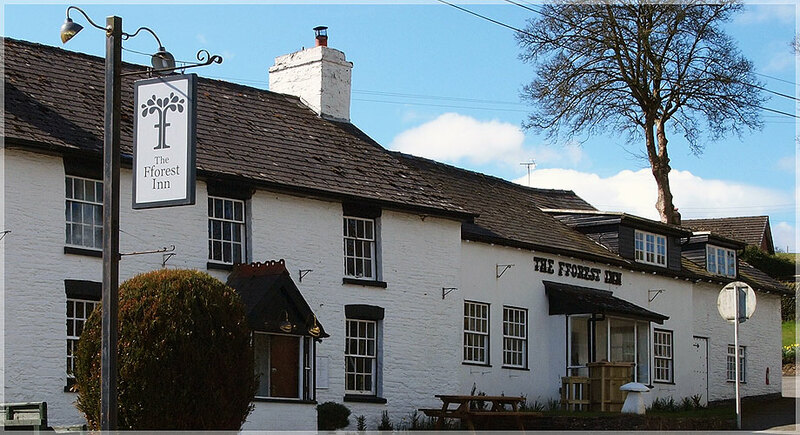 One of Wales’ oldest pubs, The Fforest Inn was originally built in the 16th century as a Drovers inn. Steeped in history and recently renovated, it still retains many of its original features but now compliments them with a comfortable, welcoming environment. Llanfihangel-Nant-Melan is a tiny hamlet in Mid Wales. The hamlet lies in a valley on the edge of the Radnor Fforest and is home to a church and two inns (the other is the Red Lion). It is on the road junction between the A44 and the A481 from Builth Wells. Above the Inn can be found Crug Eryr Castle, a Motte and bailey structure noted for its association with the visit in 1188 of the Archbishop of Canterbury and Gerald of Wales. Offering a comfortable and relaxed overnight stay for Freereiner’s with real home cooked from their small but well formed menu. It’s a great stop off for many trails including heading out to the coast for riders on the Trans Cambrian North trail. Horses stay over the night in the field behind the Inn. A warm welcome awaits at the Fforest Inn.